Highland is selling large dividers and I got one this week to try it out. I think it is a test, because everybody knows that the only thing you can do with these things is draw, in this case, a very big circle. The pair I have opens to 24-1/4 inches for a circle diameter of 48-1/2 inches and that is the next to small size. The big one opens to 50 inches for a 100 inch (that is over 8 feet, Ralph!) circle. They come with no pencil holder on the end, just two really sharp points, but you can tape a pencil, a pen, a very large crayon or a six inch paint brush to the end of the leg and you are right where you want to be. I kept trying to think what I might use these things for and I started to do some research. I suppose you could use them to do the navigation for a very large ship. If you need to lay out rafters on a roof, you could step the 24 inch spacing for marking. I remember in geometry learning how to set off a perpendicular to a line with only a divider. When we lay out batter boards for a house, we could use this to make sure the house is square, though a 3, 4, 5 triangle would probably be better. If I were a cooper, I could draw the top of my barrel with this tool. If I were a wheelwright, I could step off the circumference of the felloes in my wagon wheel to see what length the steel rim needs to be. How about painting a sign for the Lottery advertising a $100,000,000 prize? How about making a decorative sunburst? How about an arch for a kitchen entry inside your house? You can do a One-Centered Arch., a Two-Centered Gothic Arch, a Three-Centered Basket Handle Arch, a Four Centered Tudor Arch, a Segmental Arch, a Pointed Segmental Arch, a Pseudo Three Centered Arch, and a Pseudo Four Centered Arch, all with dividers and a square. How about an eyebrow dormer for your house? How about a Traditional Tangent Handrail? 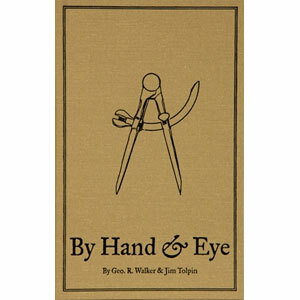 Now if you want to see what a divider can really do in construction and woodworking, get yourself a copy of “By Hand and Eye” by Walker and Tolpin from Lost Art Press. Note the cover imprint if you want a sense of what this book is all about. The main premise of the book is proportion. Our eye moves to proper proportion and we can learn to see good design in furniture and columns and buildings. It is amazing when you are able to quantify what you are seeing in design and much of it only requires dividers. Go to Section III of the book and learn a huge amount about constructing elements with a straight edge and a compass/divider. You can also go to George Walker’s web site to see animated constructions of the elements. Join with the ancient Egyptians and the Masons and the Greeks and the Romans and the classical furniture makers of England and France and start using these ancient and wonderful tools. Now I know you can design all this stuff in Sketch-Up, but let me see you find a printer big enough to make yourself a Four Centered Tudor Arch pattern to trace on the sheetrock for your kitchen wall. You can do it all with one of these honking compaii plus a straight edge. Besides, what kind of fun would it be to do it on a computer ?!! I might even start a woodworking book publishing company and use it for a logo. And you thought I was stumped. The subject is to technical for me but the article is very clear about the use of the dividers.